A replacement ammonia pump installed aboard the International Space Station by two spacewalking astronauts was successfully powered up Tuesday evening in a major step toward restoring a partially disabled coolant loop to normal operation. "The new pump now is considered fully functional, but it will take some time to fully reintegrate the pump and loop A of the two-loop external cooling system," NASA said in a statement. "Teams at mission control are following a schedule that should allow the restored cooling loop to be fully activated and integrated into the station’s cooling system on Christmas Day." Coolant loop A, one of two used to dissipate the heat generated by the space station's electronic systems, was partially shut down Dec. 11 when a flow control valve in an ammonia pump module malfunctioned, resulting in lower-than-allowable temperatures. Non-essential systems in the station's forward modules had to be shut down, including many of the lab's major research facilities. During a spacewalk Saturday, astronauts Rick Mastracchio and Mike Hopkins disconnected and removed the suspect pump module from its rack on the right side of the station's power truss. In a second spacewalk Tuesday, the astronauts successfully installed a spare pump module and reconnected ammonia coolant lines and electrical cables. Flight controllers performed a brief "aliveness" test before the second spacewalk was over. Then, starting around 4:30 p.m. EST (GMT-5), commands were uplinked to start pressurizing the new pump. "Reactivation of the pump now is complete, and it is performing its job regulating the flow and temperature of the ammonia in loop A of the two-loop cooling system," NASA said in a statement. Equipment normally cooled by loop A and powered down in the wake of the pump module valve problem will be reactivated over the next several days, the statement said. Other components that were temporarily switched over to coolant loop B will be returned to loop A in a carefully orchestrated sequence. Two astronauts successfully installed a replacement coolant pump aboard the International Space Station Tuesday, wrapping up a high-stakes two-spacewalk repair job and clearing the way for flight controllers to re-activate a critical coolant system. "We'd just like to say thanks to all the great folks doing all this hard work to get this space station back up and running," spacewalker Rick Mastracchio radioed as he returned to the Quest airlock module. "No, thank you guys," astronaut Doug Wheelock replied from mission control in Houston. "It's the best Christmas ever. Thanks, guys." "Yeah, I'd just like to add to that," Mike Hopkins said from the airlock. "Fantastic work, Merry Christmas to everybody. It took a couple of licks to get her done, but we got it." The only problem of any significance during the seven-hour 30-minute spacewalk was trouble getting one of four ammonia lines disconnected from a so-called jumper box where it was temporarily plugged in during a spacewalk Saturday. Hopkins and Mastracchio finally freed a quick-disconnect fitting holding the half-inch line in place, and were sprayed with ammonia ice crystals trapped in the connector. The toxic chemical posed no threat to the astronauts but they spent a few extra minutes in vacuum to ensure any ice stuck to their suits had time to dissipate before they re-entered the station. The ammonia contamination barely slowed the astronauts down. After freeing the stuck line, Hopkins and Mastracchio finished hooking up all four ammonia lines to the replacement pump module and plugged in five electrical cables. Flight controllers then carried out a so-called "bump" test, briefly spinning up the pump and verifying the operation of internal valves. "Good news! The thermal control officer reports a good bump start test on the newly installed pump module," NASA's mission control commentator, Rob Navias, reported. "We have a pump that is alive and well." Later today, flight controllers planned to begin re-activating coolant loop A, clearing the way to restart scientific experiments and other hardware that was shut down when the coolant loop suffered a malfunction Dec. 11. The successful spacewalk also clears the way for Expedition 38 commander Oleg Kotov and Russian flight engineer Sergey Ryazanskiy to carry out a spacewalk of their own on Friday. They plan to venture outside to mount cameras on the hull of the Zvezda command module as part of a commercial venture to beam down high-definition Earth views to subscribers around the world. Today's spacewalk was the 258th by U.S. astronauts, the 176th devoted to station assembly and maintenance since construction began in 1998, the 10th so far this year, the eighth for Mastracchio and the second for Hopkins. One hundred and 14 astronauts and cosmonauts have now spent 1,107 hours and 37 minutes of spacewalk time building and maintaining the International Space Station since construction began in 1998. Mastracchio's total through eight spacewalks now stands at 51 hours and 28 minutes, moving him up to sixth on the list of most experienced spacewalkers. Hopkins total EVA time through two spacewalks stands at 12 hours and 58 minutes. The goal of today's outing was to install a replacement ammonia pump module in coolant loop A, one of two cooling systems used to dissipate the heat generated by the station's electrical systems. A valve in the loop A pump assembly malfunctioned Dec. 11, partially disabling the system and forcing flight controllers to power down non-essential systems. More important, the malfunction left the station one failure away from a much more drastic powerdown should the lone operational coolant loop break down. During a five-hour 28-minute spacewalk Saturday, Mastracchio and Hopkins disconnected the suspect ammonia pump module on the right side of the station's main power truss, pulled it from its slide-in rack in the S1 segment of the truss and mounted it on a nearby storage fixture to complete phase one of the coolant system repair job. Because of an accidental switch throw inside the airlock at the end of the spacewalk, a small amount of water got into the plumbing of Mastracchio's backpack, raising the possibility that potentially damaging ice could form during the second EVA. As a result, Mastracchio assembled a different suit for the second spacewalk while Hopkins used the one he wore Saturday, the same suit that developed a potentially dangerous leak during a July spacewalk. After exhaustive troubleshooting, engineers concluded the leak was caused by contamination that clogged a filter. While the root cause of the contamination has not yet been determined, the astronauts replaced suspect components and both suits performed normally during both coolant repair spacewalks. 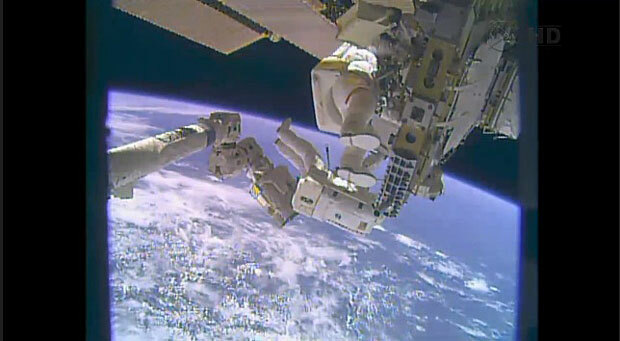 During their second spacewalk Tuesday, Mastracchio and Hopkins focused on installing the replacement pump module. 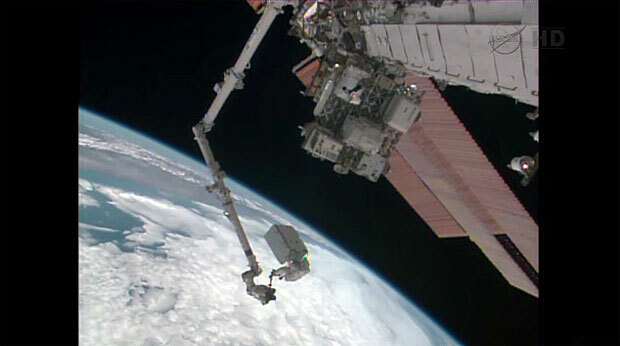 In spectacular video downlinked from the station, Mastracchio and Hopkins, anchored to the end of the station's robot arm, could be seen unbolting the spare pump module from its storage pallet and pulling it from its insulated enclosure. "Looks like you're almost there," Mastracchio radioed as arm-operator Koichi Wakata, working inside the Destiny lab module, slowly pulled Hopkins and the pump assembly away. "You're out of the groove there, Mike, I think you're in charge now of the pump module. ... It's stable, Mike, it looks good, you're doing a great job, it looks beautiful." 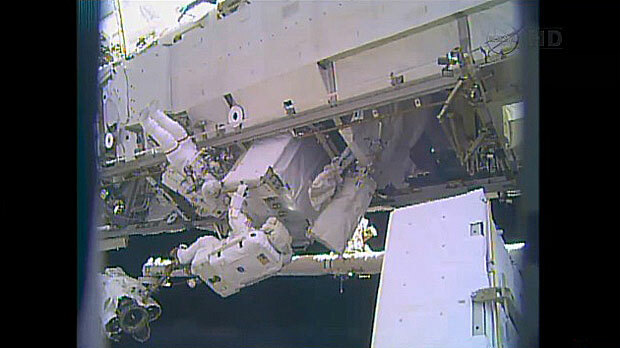 Hopkins held the tethered pump module in his gloved hands as Wakata slowly moved him inboard from the storage pallet on the S3 truss segment to the pump's install location in the S1 segment. The astronauts then guided the big module into place and drove home bolts to lock it down. They had no trouble hooking up the first two ammonia lines, known as M1 and M2. 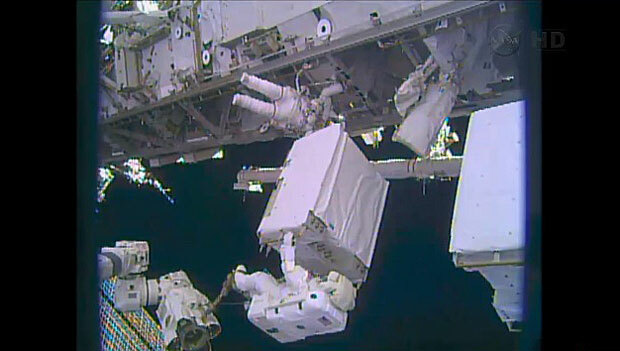 Another two lines, M3 and M4, were attached to a jumper box Saturday to allow the ammonia in the coolant loop to expand and contract as needed when the station flew into and out of sunlight. The astronauts initially were unable to disconnect the half-inch-wide M4 line from the jumper box. Mastracchio retrieved a tool designed to apply additional force to the quick-disconnect bale holding the mechanism together. The idea was to push the lever far enough over to allow the astronauts to depress a locking button, allowing them to separate the two sides of the fitting. But the stubborn fitting refused to cooperate. "One thing we never expected," Mastracchio muttered at one point. After positioning the quick-disconnect tool with varying degrees of force, flight controllers decided to lower the pressure in the line. Right around that point, the astronauts successfully demated the stubborn fitting, but reported "we do have snow coming out." A few moments later, astronaut Douglas Wheelock in mission control asked the spacewalkers if ammonia was still leaking out "or has it dissipated." "Yes. It's about one every second, one little snowflake a second," Mastracchio replied. Asked if their spacesuits had been hit by any ice, Mastracchio said "absolutely," adding a few moments later "they are just completely drowning us now." "Copy, Rick," Wheelock said. "And we have no video, Rick, so we'll just take your continued description." "OK. They're pretty good size particles, much bigger than anything we've ever seen. See that big one going by you, Mike?" "It looks like they're coming inboard of the pump module, all around the pump module, looks like," Mastracchio said. "I can't see it everywhere, where the light is, but they're hitting the wrist cluster of the SSRMS (robot arm), they're enveloping Mike, probably enveloping me, also." "Yes they are," Hopkins said. "Big chunks, big chunks." The ammonia presumably was trapped in the line and expelled when flight controllers sent commands to vent the jumper box. The leak rate diminished a few moments later and the astronauts pressed ahead with work to attach M4 and then M3 to the replacement pump module. The ammonia posed no threat to the spacewalkers, but they had to spend a few extra minutes in vacuum to give any ice crystals that may of stuck to their suits time to dissipate. Decontamination procedures have been required during past spacewalks involving the ammonia coolant system to make sure returning spacewalkers don't introduce any toxic material into the station's air supply. NASA originally held open the possibility of a third spacewalk to complete the coolant system repair work, but with the successful pump installation and activation Tuesday, the station crew now can look forward to a quiet Christmas in orbit before making preparations for the Russian spacewalk Friday. Working to reconnect ammonia coolant lines to a replacement pump module, astronauts Rick Mastracchio and Mike Hopkins ran into problems freeing a quick-disconnect fitting and reported being "enveloped" in a cloud of ammonia ice crystals that spewed out arond the time flight controllers lowered pressure in the lines to make them easier to separate. The astronauts had no problems installing the spare pump unit, bolting it in place and connecting the first two of the four ammonia coolant lines. The final two lines, known as M3 and M4, were connected to a bypass assembly Saturday to allow the ammonia in coolant loop A to expand and contract while the pump replacement was in progress. 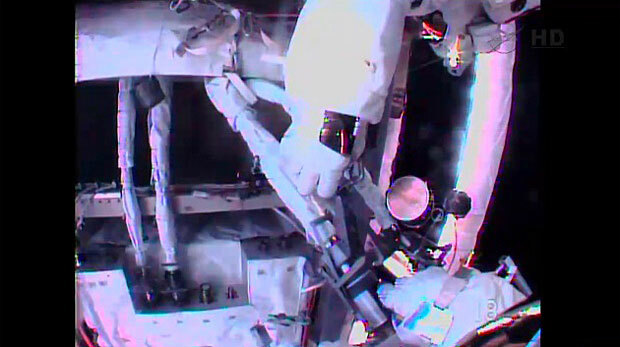 Today, the astronauts had trouble disconnecting the half-inch-wide M4 line from the jumper box. Mastracchio retrieved a tool designed to apply additional force to the quick-disconnect bale holding the mechanism together. The idea was to push the lever far enough over to allow the astronauts to depress a locking button, allowing them to separate the two sides of the fitting. "One thing we never expected," Mastracchio observed at one point. "Copy that, we're taking a look to see if maybe that could be residual in that spring cavity," Wheelock said. "Stand by." "And for both of you, could you tell us if any of the flakes contacted your suits?" Wheelock asked. A few moments later, he said: "They are just completely drowning us now." The ammonia posed no threat to the spacewalkers, but they likely will have to spend additional time outside to give any ammonia crystals on their suits time to dissipate before re-entering the space station. Decontamination procedures have been required during past spacewalks involving the ammonia coolant system to make sure returning spacewalkers don't introduce any toxic material into the station's air supply. But the immediate priority was to finish reconnecting the replacement pump module, the final step in repairing coolant loop A. The balky M4 line was connected to the pump module with no problem and the larger 1.5-inch-wide M3 line was attached and plugged in a few minutes later. Flight controllers plan to carry out a quick test later today to make sure the replacement pump module is working properly. It's not yet clear how much time Mastracchio and Hopkins might have to spend carrying out decontamination procedures, but the astronauts have more than enough air, water and power to make sure any ammonia still on their suits has time to dissipate. Astronauts Mike Hopkins and Rick Mastracchio disconnected a spare ammonia pump module from a storage pallet aboard the International Space Station Tuesday, pulled it from a protective enclosure, maneuvered it into place for installation in the lab's cooling system and drove home four bolts to lock it down. Running about a half-hour behind schedule, the last bolt was tightened down three hours and 15 minutes after the spacewalk began. Hopkins and Mastracchio then began work to re-connect four ammonia coolant lines before turning their attention to five electrical cables to tie the pump module into coolant loop A. The astronauts have not encounteed any major problems and both report their spacesuits are working normally, with no buildups of water or any other issues. 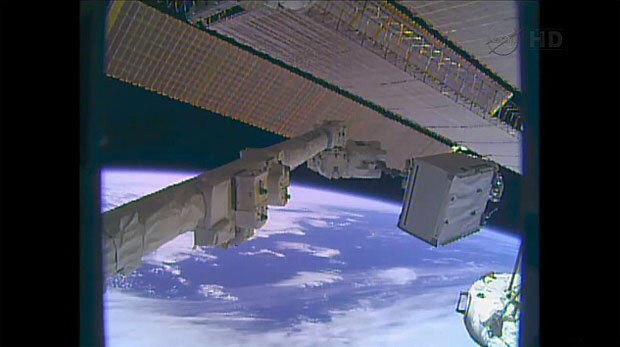 In spectacular video downlinked throughout the morning, Mastracchio and Hopkins, anchored to the end of the station's robot arm, could be seen unbolting the spare pump module from its storage pallet and pulling it from its insulated enclosure. 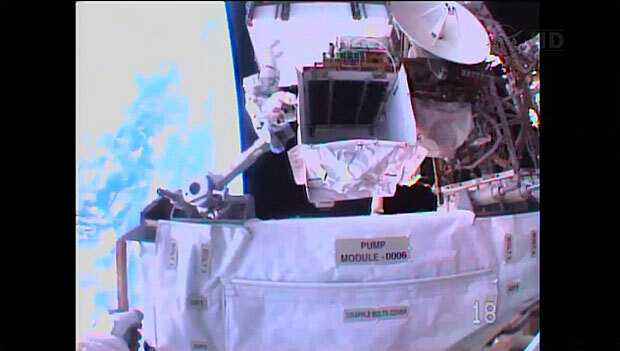 Hopkins held the tethered pump module in his gloved hands as Wakata slowly moved him inboard from the storage pallet to the pump's install location in the S1 truss segment. While the move was in progress, Mastracchio, closing up the spare pump's storage enclosure, reported a small micrometeoroid-orbital debris -- MMOD -- impact on the storage platform. "Hey Houston, I did see a pretty good MMOD strike," he called down. "I took some pictures of it. It was well clear of us and well clear of any handrails. I'll show you the pictures when I get back in." "Could you give us a general location where you saw that MMOD strike?" astronaut Douglas Wheelock asked from mission control. "It was right on ESP-3 (external storage platform No. 3), right on the SPACEHAB emblem, kind of under the pump module, facing... I don't know which way it was facing," Mastracchio said. Space debris and micrometeroid strikes are not uncommon and flight controllers keep track of their locations, when found, to make sure spacewalkers know where they might encounter sharp edges that could potentially damage their suits. An hour-and-a-half into a planned six-hour spacewalk, astronauts Rick Mastracchio and Mike Hopkins have completed initial preparations and are now in the process of disconnecting a spare ammonia pump module from a storage pallet on the right side of the International Space Station's solar power truss. Mastracchio is working to unplug three electrical cables while Hopkins, anchored to the end of the station's robot arm, is standing by to help out with bolts holding the 780-pound pump assembly in place. 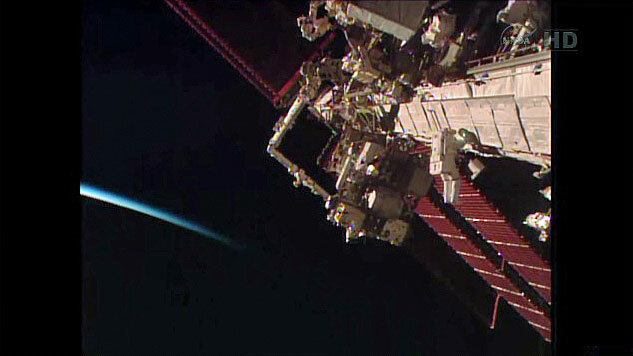 Once the unit is free, Japanese astronaut Koichi Wakata, operating the robot arm from a work station inside the Destiny laboratory module, will pull Hopkins and the pump module away from the storage platform and maneuver them both inboard to the S1 truss segment where the replacement pump will be installed. Spectacular video from orbit earlier today showed the two astronauts as they got in position and prepared their equipment during a daylight pass over South America and central Europe. "Beautiful view," Hopkins marveled at one point. "Yeah, you're right over the heart of South America," astronaut Douglas Wheelock replied from mission control in Houston. A few minutes later, the station was over Europe. "How do you like riding the arm, Mike?" Mastracchio asked. "It's good," Hopkins laughed. "Beautiful view." "Yeah, you're kind of hanging on by your feet, aren't you?" So far, the spacewalk is proceeding smoothly with no technical problems of any significance and the astronauts' spacesuits are performing normally. Astronauts Rick Mastracchio and Mike Hopkins, floating in the International Space Station's Quest airlock module, switched their spacesuits to battery power at 6:53 a.m. EST (GMT-5) Tuesday, officially kicking off a planned six-hour Christmas Eve spacewalk to complete repairs to the station's cooling system. For identification, Hopkins, call sign EV-1, is wearing an unmarked suit with helmet camera No. 18. Mastracchio, EV-2, is wearing a suit with red stripes around the legs and using helmet camera No. 20. Switching roles for their second spacewalk, Hopkins will spend most of the day anchored to the end of the station's robot arm while Mastracchio will assist as a tethered free floater. "Let's go to work," Hopkins said just before floating out of the airlock as the space station sailed 260 miles above eastern China. Assuming the repair work goes well and a third spacewalk is not required, two Russian cosmonauts will venture outside Friday for an already planned excursion to install cameras on the Zvezda command module that will be used by a Canadian company to beam down high-definition Earth views to subscribers around the world. Today's spacewalk is the 258th by U.S. astronauts, the 176th devoted to station assembly and maintenance since construction began in 1998, the 10th so far this year, the eighth for Mastracchio and the second for Hopkins. 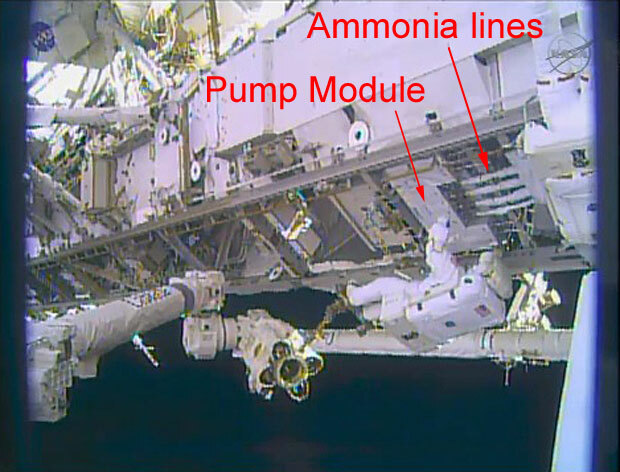 The goal of the excursion is to install a replacement ammonia pump module in coolant loop A, one of two cooling systems used to dissipate the heat generated by the station's electrical systems. A valve in the loop A pump assembly malfunctioned Dec. 11, partially disabling the system and forcing flight controllers to power down non-essential systems. More important, the malfunction left the station one failure away from a more drastic powerdown -- and possible evacuation -- should the lone operational coolant loop break down. As a result, Mastracchio is wearing a different upper torso and backpack, No. 3005, for the second spacewalk while Hopkins is using the one he wore Saturday, No. 3011. That's the same suit that developed a potentially dangerous leak during a July spacewalk. After exhaustive troubleshooting, engineers concluded the leak was caused by contamination that clogged a filter. While the root cause of the contamination has not yet been determined, the astronauts replaced suspect components and both suits performed normally during Saturday's spacewalk. During their second spacewalk Tuesday, Mastracchio and Hopkins plan to take a spare pump module from a storage pallet attached to the S3 truss segment, install it in place of the faulty unit and reconnect four ammonia lines and five power cables. 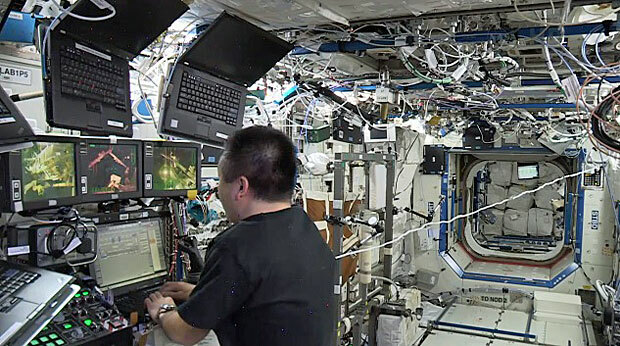 Assuming the spare unit works as expected, flight controllers will power up the systems that were shut down earlier, restoring the space station to normal operations. The work marks the second time in three years station astronauts have had to replace the coolant loop A pump module. In August 2010, two other astronauts needed three spacewalks to install the unit that was removed Saturday after the pump in the original module suffered a failure and stopped working, taking down the entire coolant loop and forcing the crew to implement widespread powerdowns. This time around, the pump in question was in good health, but a flow control valve in the system's plumbing malfunctioned, resulting in lower-than-allowable ammonia temperatures. Engineers attempted to restore coolant loop A to near-normal operation using a software "patch," but NASA managers ultimately decided to replace the pump module. During the 2010 spacewalks, the astronauts ran into problems with ammonia line quick-disconnect fittings, but applying lessons learned, Mastracchio and Hopkins had no trouble Saturday, getting far enough ahead of schedule to go ahead and remove the pump module, work originally planned for the second spacewalk. Assuming the replacement pump gets installed and works properly, NASA will forego a third spacewalk, leaving the faulty pump unit where it was mounted Saturday for the next several months. At some point, a future team of spacewalkers will need to move it to a more secure storage location, but there's no hurry. A thermal analysis shows the pump module can remain where it is until next summer. In the meantime, two Russian cosmonauts, Expedition 38 commander Oleg Kotov and Sergey Ryazanskiy, are gearing up for a spacewalk of their own on Friday to install high-definition and medium-resolution cameras for a Canadian company, UrtheCast, and to replace external materials science experiments. They are expected to open the hatch of the Pirs airlock module around 7 a.m. Friday to begin the year's 11th and final planned space station spacewalk.